The LE1700 is the first slate tablet PC on the market to offer Intel’s Core 2 Duo technology for greater than twice the CPU performance when compared to the previous generation Intel® Centrino®. Core 2 Duo increases system responsiveness when running multiple applications and extends mobility with smart battery power management. With the LE1700, Motion incorporates complete wireless connectivity – including CDMA/EV-DO mobile broadband technology capabilities, WiFi® and Bluetooth® – ensuring uncompromised access to the Internet, email and networked applications. Motion’s embedded wireless broadband technology is a built-in CDMA2000 1xEV-DO (Evolution Data Optimized) Revision A (Rev. A) mini card. Motion is working with multiple carriers to certify integrated WWAN service and will announce those partnerships separately. Users can take advantage of any 3G/HSDPA mobile broadband service with a purchased data plan of their choice and the accompanying activation SIM card to plug into the LE1700. The LE1700’s innovative battery logistics can help mobile professionals achieve up to a full work day of computing time. The Standard Battery provides more than three hours of use, and a slim, optional Extended Battery attaches flat against the back of the LE1700, maintaining even distribution of weight and balance, and extending computing time. The LE1700’s advanced security and asset protection capabilities help ensure user, network and enterprise data are safe. 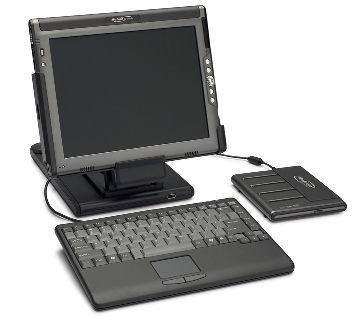 The LE1700 is available with Computrace, an optional tracking service from Absolute Software that will recover tablets if they are stolen or missing. Computrace comes with embedded support in the BIOS, a Recovery Guarantee of up to $1000 and subscribers also have the option, at their discretion, to activate a remote Data Delete feature to protect sensitive data on missing or stolen computers. Motion included its DataGuard hard drive accelerometer on the LE1700 to further protect data stored on the hard drive. When a potentially hazardous shock or drop is detected, DataGuard stops your hard drive by moving the read-and-write head to areas that do not contain data. The protection system turns the hard drive on again once the shock sensor detects a stable environment. Other system security features include an embedded Trusted Platform Module (TPM) to enable hardware-based encryption and authentication. A built-in fingerprint reader uses biometric data to prevent unauthorized access to system resources and encrypted data. The ability to disable both the 802.11 network connection and Bluetooth with a single on/off switch adds greater control in high-security environments. Finally, the Motion Security Center allows for quick access to the tablet PC’s authentication, password and encryption applications. 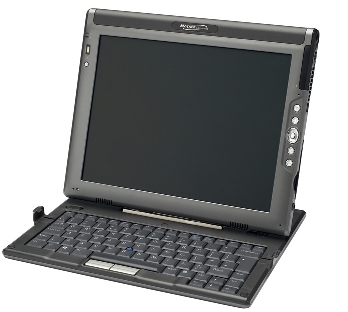 At 2.2 lbs., Motion’s LS800 with 8.4” SVGA display offers full Microsoft Windows XP Tablet PC functionality so you have the power of a desktop in the palm of your hand. Motion’s LS800 Tablet PC redefines mobile computing with its unique size and remarkable power. This revolutionary addition to Motion’s award-winning Tablet PC series will keep you and your business on the move. This lightweight Tablet PC is exceptionally durable. That means you can bring Tablet PC productivity into new and diverse environments for the very first time. Not only great for highly-mobile office use, the LS800 is equally at home at a warehouse or construction site, on an all-day delivery or service route, on hospital rounds or in patient consultations. We’ll take you where you want to be. The LS800 Tablet PC, the most recent innovation in Motion Computing’s award-winning Tablet PC series, is stunningly compact and offers exceptional mobile performance with Intel® Centrino™ Mobile Technology. Experience all the power of a full-size Tablet PC that can be held comfortably in one hand. No one else offers a Tablet PC this compact, this powerful and this mobile. •Extremely lightweight at 2.2 lbs. •Enjoy an 8.4” no-compromise SVGA display that provides a superb Windows XP Tablet PC experience your business on the move. 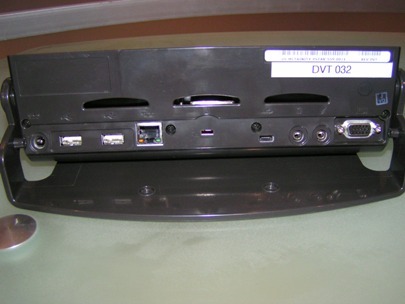 For more information, contact your Motion Solution Provider, call 1.866.MTABLET or visit www.motioncomputing.com. L2 cache and 400MHz FSB) Dimensions 8.94"x 6.69"x 0.87"
Chipset •Mobile Intel 915GMS Express Chipset Weight 2.2 lbs. -Operation:sea level 0 to 10K ft.
-Storage:sea level 0 to 40K ft. The LE1600, the latest addition to Motion’s award-winning Tablet PC series, is a true breakthrough in optimizing the balance between high-end performance,battery life and a sleek,lightweight design.The LE1600 Tablet PC advancedpure slate design features Intel® Centrino™ Mobile Technology and integrated high-speed wireless connectivity to meet all of your mobile computing demands. The LE1600 integrates the latest innovations in ultra-mobile technology with the optimum balance between high-end performance and a lightweight, purely flexible Tablet PC. The LE1600 provides an impressive bundle of features that will enhance your mobility and productivity. If you’re looking to take your mobile computing experience to new levels, look no further than the LE1600 Tablet PC. Its remarkable features, revolutionary design and unmatched performance are sure to keep you and your business moving forward. 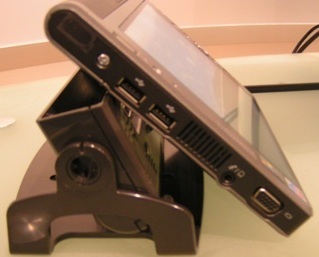 Motion also offers the LE1600 as a mobile thin client. Intel® Pentium® M Processor LV 758 (1.5 GHz)or Intel Celeron® M Processor ULV 373 ( 1.0 GHz). Speak Anywhere™ audio offers a multi-directional array microphone design and configurable acoustics software. The Motion Security Center lets you customize specific levels of protection. Integrated Fingerprint Reader prevents unauthorized access. Embedded Trusted Platform Module (TPM) protects data by enabling hardware-based encryption. - Operation: sea level 0 to 10K ft.
- Storage: sea level 0 to 40K ft.
1Weight represents approximate system weight measured with a 35WHr battery, empty PCMCIA slot and no pen. Actual system weight may vary depending on component and manufacturing variability. 2Depends on conditions, settings and usage patterns. 3Weight represents approximate system weight measured with both the 35WHr Standard Battery and a 40WHr Extended Battery attached, empty PCMCIA slot and no pen. Actual system weight may vary depending on component and manufacturing variability. 4Approximate charging time. Validated charging from 5% to 90% with system on or system off. Since its launch, the Motion M1200 has been garnering awards from throughout the industry. 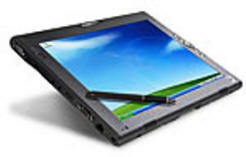 Now the Motion M1400 and M1300 join the Motion Computing family of Tablet PCs. Already the winner of several industry awards, Motion Computing has earned its high ranking in the Tablet PC field. Motion Computing™ now offers the Motion M1400 with the latest Centrino technology, a much-improved wide viewing angle of 170%, additional security and a thinner profile. Motion is once again ahead of the competition with the first Tablet PC that has a combination of an indoor/outdoor screen with a wide viewing angle. For users who need a screen that's clear inside or outdoors in bright sunlight, the Motion M1300 and now, the M1400 each offers an optional View Anywhere™ Display, which offers a unique capability for Tablet PC users who want an indoor-viewable screen equally suited for outdoor use. The bright 12.1-inch XGA indoor-outdoor display is based on optical enhancement technology initially developed for high-end marine, GPS and military applications. The View Anywhere option provides uncompromised indoor and outdoor viewing without sacrificing battery life – a combination of user benefits unique in the tablet PC market. No matter which product you select, Motion Computing offers innovative improvements and add-ons that keep the Motion Tablet PCs at the top of the "want" list. Motion Computing's entry into the Tablet PC field got a lot of attention at the Launch. The pure slate design along with its sleekly-designed docking station, well-balanced feel and futuristic-looking speakers drew admiring glances and lots of questions. 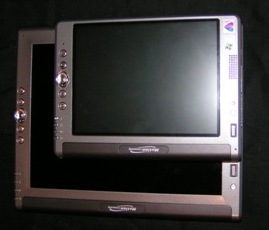 The Motion M1200 Tablet PC was one of only two models offering a 12.1" screen. untethered access to applications and accessories. Motion Tablet PCs are powerful computing platforms that will grow with your changing needs. High capacity hard drives with up to 60GB of disk storage and up to 2GB* of memory allow you to scale your system to meet your unique computing needs. IEEE-1394 and USB 2.0 connectivity deliver high-speed data transfer to a wide variety of external devices, including DVD drives, cameras or portable printers. All Motion Tablet PCs deliver truly optimized performance to handle your most demanding computing needs all while streamlining office workflow, increasing productivity, minimizing errors and decreasing costs. convenient, single-step global password management. batteries. Motion Tablet PC batteries also feature LED battery gauges, designed to give you instant information regarding your remaining battery life. Motion Tablet PCs' innovative features and design make mobile computing effortless – on the road, in the office and everywhere in-between. Motion Tablet PCs – there has never been a more powerful tool for being truly productive in today's expanding workplace. *Some features or options may not be available on M1300 models. Motion's lightweight, ergonomic Pure Tablet design delivers maximum ease of use — in a PC the size of a spiral-bound pad of paper. Its spacious 12.1-inch screen is 35 percent larger than the 10.4-inch screen others offer. And its less than 1-inch thick dimensions make it comfortable to hold and use. Perfectly balanced, there is no unwieldy clamshell design —or hinges to wear out. Business today occurs far beyond the walls of the typical office. The workforce is increasingly mobile. And these employees require tools that can adapt to the rapidly changing digital workplace. Maximize your view with the 12.1" display-- the largest of any Tablet PC slate. At less than 3 lbs., it can go anywhere, anytime. 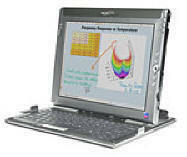 The Tablet PC provides the full power and functionality of today's notebook PCs-with no sacrifices. With Microsoft Windows XP Tablet PC Edition, you get the features of Windows XP Professional, you can run Windows XP-compliant applications, and you get the added capabilities of pen-based computing: use a digital pen to input handwritten information into your computer, and use the pen to control your computer, like you would with a keyboard or mouse. Tablet PC's are primary business PCs and can be attached to standard USB keyboards, monitors, and mouse devices for easy computing at your desktop. Motion Computing provides freedom and power by using breakthrough design to create the first truly human-focused Pure Tablet PCs - for the ultimate in mobility and productivity.
. Operation: sea level 0 to 10K ft.
. Storage: sea level 0 to 40K ft.
Dimensions • 11.65" x 9.45" x .87"
Business today occurs far beyond the walls of the typical office. More than ever,mobile workers need computing tools that adapt to the changing digital workplace. That's why professionals – across a variety of industries such as healthcare, education, government and field services and sales – are taking the unique features and ultra-mobile design of the Motion Tablet PC into more places than ever. Motion Computing, a Tablet PC market leader, creates award-winning Tablet PCs that are designed to work the way you do – providing the industry's best integration of Intel® Centrino™ Mobile Technology computing, the advantages of digital-ink and the full functionality of Microsoft® Windows® XP. Motion Tablet PCs combine the mobility of a PDA, the versatility of a laptop and the power of a desktop into a single, easy-to-use device. Healthcare practitioners use Motion Tablet PCs to access real-time patient information from the bedside while making their rounds. Educators and students use digital ink to annotate homework, create class presentations or draft lecture notes. On a sales call, field sales representatives wirelessly stream multimedia presentations onto the large display, access real-time product availability information and gather electronic customer signatures to close a sale. Motion Tablet PCs bring all the power of the PC to everywhere you work today – delivering full productivity from the hallway, to the meeting room, to the campus and beyond. Motion Tablet PCs put the features of Microsoft Windows XP Tablet PC Edition to work for you, inviting you to experience a truly paperless world. Take notes, annotate documents or presentations, send handwritten emails, and even navigate the web - all with the simple stroke of a pen. And Motion's unique Speak Anywhere™ audio technology* delivers advanced clarity in recording and playback of your audio notes, without the need of a headset. Motion's striking 12.1" displays feature wide viewing angles and provide a remarkably similar feel of pen to paper. Motion's innovative View Anywhere™ display option offers advanced viewability, particularly for those who work outdoors. Motion's Ambient Light Sensor technology* uses a built-in sensor to automatically adjust the display brightness, minimizing battery drain and optimizing viewability. Motion Tablet PCs can be used as a slate when mobile or in full-function desktop mode, with a keyboard and wide array of accessories, when docked. Motion Tablet PCs are designed for every type of work scenario and simple one-handed, graband-go docking makes it easy to switch between work environments without interruption. Demonstrating market leadership and a nimble build-to-order business model, Motion Computing introduced an innovative slate Tablet PC with the breakthrough mobile performance of Intel® Centrino™ technology. The first “pure slate” on the market to feature Intel’s most advanced mobile architecture, the Wi-Fi-enabled Motion M1300 Tablet PC delivers more processing power and longer battery life. Compared with the company’s former top-line product, the award-winning M1200, the M1300 operates up to 30 percent faster and extends typical battery life by 10 to 15 percent. Both the M1300 and the M1400 with the wide-viewing angle are now available with the Motion View Anywhere™ Display, which offers a unique capability for tablet PC users who want an indoor-viewable screen equally suited for outdoor use. "The new View Anywhere technology is a major step forward for ultramobile computing in virtually any low-light or bright-light environment, and everything in between," said David Altounian, Motion’s chief product officer. "This is Motion's innovative response to the many potential customers -- ranging from government and the military to insurance and field sales -- who told us they need 'ubiquitous viewing' on a tablet PC." The Motion View Anywhere display is priced as a $299.99 option on the Motion M1400 powered by Intel Centrino mobile technology. 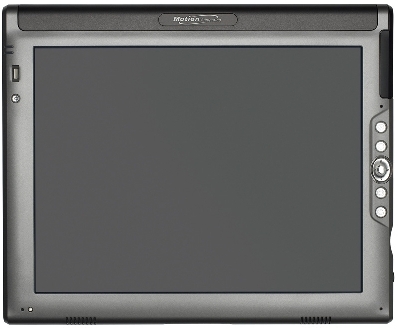 Priced from $1,799, the M1300 and the M1400 Tablet PC is available now at http://motioncomputing.com or from more than 70 value-added resellers (VARs) in North America and the UK. Motion VARs serve a wide range of vertical markets, including healthcare, education, financial services, government, legal, and field sales and service. Motion Computing offers a variety of input devices, including our unique Mobile Keyboard with Touchpad, to make your M1300 even easier to use. Say goodbye to remembering multiple passwords with the Motion Fingerprint Reader. As a mobile computer user, convenience and security are two of your primary concerns. PC Card format & retractable fingerprint reader provide a highly mobile solution without the hassles of wires, dongles, or access cards. The new Motion Hardtop Keyboard combines the functionality of a keyboard, stand, and display cover into a single product. The innovative Hardtop Keyboard "snaps" onto the front of the Motion Tablet PC - providing both convenient access and display protection. The Hardtop Keyboard can be stowed away by attaching it to the back of the tablet when used in "slate" mode. 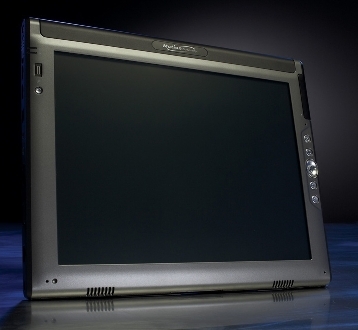 When needed, the Motion slate easily slides into the frame for exceptionally stable use on lap or desktop. Lightweight and easy to use, the Hardtop Keyboard works equally well on a conference table or on an airplane tray table. It also features an integrated pointing stick and mouse buttons - making it an ideal travel companion! Motion Computing’s docking solutions are the perfect way to extend the use of your Motion Tablet PC and operate it as a full-featured desktop PC. Our docking solutions support one-handed, hot "grab-and-go "docking/undocking, allowing you to quickly remove or insert the M1200 or M1300 while it is running. Motion Computing’s full line of cases and portfolios support a wide range of uses and functionality —while protecting your investment.